Not exactly what you were expecting, right? Now, respectable flower delivery companies are supposed to hand deliver you beautifully pre-arranged flowers in a vase, but some flower delivery companies frankly don't know what they're doing. You obviously had no clue they were going to carelessly ship you dehydrated, overheated flowers devoid of all their natural life essence. It's not your fault, but you're in a nasty pickle nonetheless (doesn't this happen all too often in everyday life?). 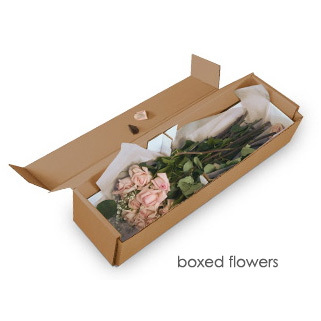 Well, consider this post your good karma as you get tips from our expert florists on how to revive your boxed flowers and make them look as fresh as possible. Cut the scraggly leaves and petals – If there are any overly dehydrated or dead leaves or petals on the flowers, you will want to go ahead and get rid of them. Neatly cut the worst looking parts of the flowers off. If there are any completely dead or withered flowers, consider throwing those away. Cut the stems of the flowers – In order to properly rehydrate the flowers, cut a little off the stem. Keep the type of arrangement you want in mind, so cut the most dried out flowers or worst looking flowers the shortest. Look for the liveliest flowers in the box and cut those a bit longer, but keep the height of your vase in mind so your flowers aren't way too short or too long in comparison. It is a good idea to cut the stems under water, so no air will get into the flower in the process. Put the flower in warm water – The water should be set at a temperature of about 100 degrees Fahrenheit. As said in the previous step, it is smart to cut the stems while they are in the warm water. Leave the flowers in the water for an hour or two, and make sure the vase is filled nearly to the top, just under the bulbs if possible. Arrange the flowers – After you let the flowers soak in hot water, arrange them in the vase however you like. Try to choose a dominant centerpiece flower, and place the flowers at different angles to give the arrangement a nice, balanced feel. Hopefully the flowers have been hydrated enough by now to create a worthy display. Arrange in order of flower size, so arrange the larger flowers first, the smaller flowers next, and finally add the foliage at the bottom if you choose to. Adding foliage is a good idea to fill in gaps between the flowers and accentuate the mix of colors. Now your flowers are as hydrated and beautiful as possible. In the future, make sure to buy your flowers hand-arranged in a vase. The best option of all is to buy from local florists who will take the time and care to arrange your bouquet with the freshest flowers. From now on, stay away from flowers carelessly stuffed into a box.